The personal pronoun vous can be summarized as "the formal and/or plural ‘you ’." It serves as every type of personal pronoun, but its role as a subject pronoun is in some ways the trickiest. With regard to verb conjugation, vous is always second person plural, no matter how many people it refers to. Monsieur, avez-vous besoin d’assistance ? Sir, do you need help? Madame, avez-vous besoin d’assistance ? Ma’am, do you need help? Messieurs, avez-vous besoin d’assistance ? Gentlemen, do you need help? Mesdames, avez-vous besoin d’assistance ? Ladies, do you need help? In terms of agreement, however, vous is more complicated: it depends on whom exactly vous refers to. 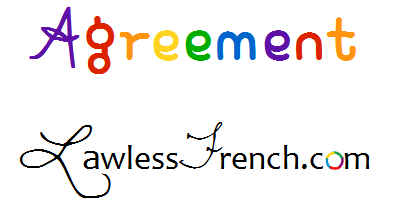 If it’s a single man, there’s no agreement, whereas a single woman requires feminine agreement. Likewise, multiple men and multiple women require plural and feminine plural agreement, respectively. Êtes-vous prêt, Monsieur ? Are you ready, sir? Êtes-vous prête, Madame ? Are you ready, ma’am? Êtes-vous prêts, Messieurs ? Are you ready, gentlemen? Êtes-vous prêtes, Mesdames ? Are you ready, ladies? Êtes-vous allé à la banque, Monsieur ? Did you go to the bank, sir? Êtes-vous allée à la banque, Madame ? Did you go to the bank, ma’am? Êtes-vous allés à la banque, Messieurs ? Did you go to the bank, gentlemen? Êtes-vous allées à la banque, Mesdames ? Did you go to the bank, ladies? When vous is a direct object and precedes an avoir verb in a compound tense/mood, it likewise has to agree with the actual gender/number of the noun it represents. Monsieur, je vous ai vu au musée. Sir, I saw you at the museum. Madame, je vous ai vue au musée. Ma’am, I saw you at the museum. Messieurs, je vous ai vus au musée. Gentlemen, I saw you at the museum. Mesdames, je vous ai vues au musée. Ladies, I saw you at the museum.